Greetings! I am Mark Carroll. 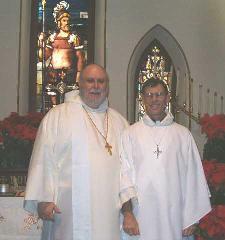 Pictured above with me at my ordination is the Right Reverend Curtis Bradley at the historic Chapel of the Centurion in Fort Monroe, Virginia. The Chapel was completed in 1854, and is my "home church" where I was baptized and ordained, my wife and I had our marriage blessed in an Epsicopal Church service here, and my family members were baptized and confirmed in the Epsicopal Congregation. Curtis and I are fellow centurions and co-workers for Christ in the international non-denominational Christian fellowship, the Order of Centurions.